The brick mortar joints form the space between the bricks blocks which are filled by mortar or a grout mixture. The type of mortar joint chosen in the masonry construction will govern the overall aesthetics of the surface, if there is no plan to plaster. Different mortar joint patterns not only provide different look but also ensure watertight properties and maintain the structural integrity of free standing walls. 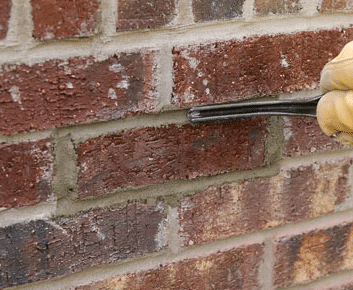 Mentioned below are the most common types of mortar joints used in brick masonry construction. 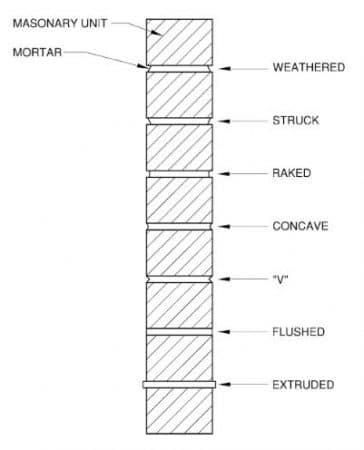 The struck mortar joint is employed for horizontal joints. Due to water seepage issues from the lower edges, these are not recommended for exterior masonry wall joints. As shown in the figure-1 above, the bottom edge is recessed. The top edge of the joint will be finished flat with the brick edge. The slope provided in this joint will pull the water and hold water in the brick. So it is best employed for interior walls. Concave joint is made with the help of a curved steel jointing tool. This is a popular mortar joint type practiced due to its high resistance to rain water penetration and tight sealing property. The tool used in this work will let the mortar remain tight. A properly placed mortar joint will help to resist the water penetration efficiently. The weathered joint is most employed for horizontal joints. This joint will let the water shed from the joint. If the placed mortar in the joint is not adhered properly, there are chances of water movement through the underside of the joint. This can result in shrinkage cracks along the bond line. Raked joint like struck joints are not used for exterior wall construction. This is because of the ledge that is formed in the joint, which lets the snow, ice or water to stay on the top of the brick. 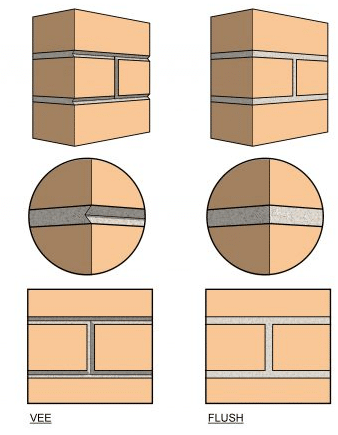 This joint has less space between the mortar joint and the top of the brick unit as shown in the figure-1. This space is created where the core exists and let the entry of water thus penetrating into the wall. Hence this joint is best used for interior walls. The v-joint does not provide any form of water penetration protection due to its geometry. The v-joints in brick masonry construction must be tooled properly so that no water gets accumulated within the groove created. Proper tooling of v-joint helps to prevent water accumulation and the penetration into the brick. Flush joints are used in brick wall construction, when the surface requires plastering and final finishing. Thus the flush joints will be hidden. The construction of flush joint takes more time and work to make it watertight and water resistant. If the flush joints are created such that it stands out of the brick, there are chances for water to sit on its top. Here, the mortar is not compressed into the joint so it is difficult to maintain a consistent bond with the brick is difficult. The extruded joint type does not require any kind of tooling. Here, the mortar present in excess in the joint will naturally squeeze out and forms an extrusion between the bricks. The extruded joints are subjected to degradation when subjected to different weather conditions.